The Operation Rudy Team at Granville Island. 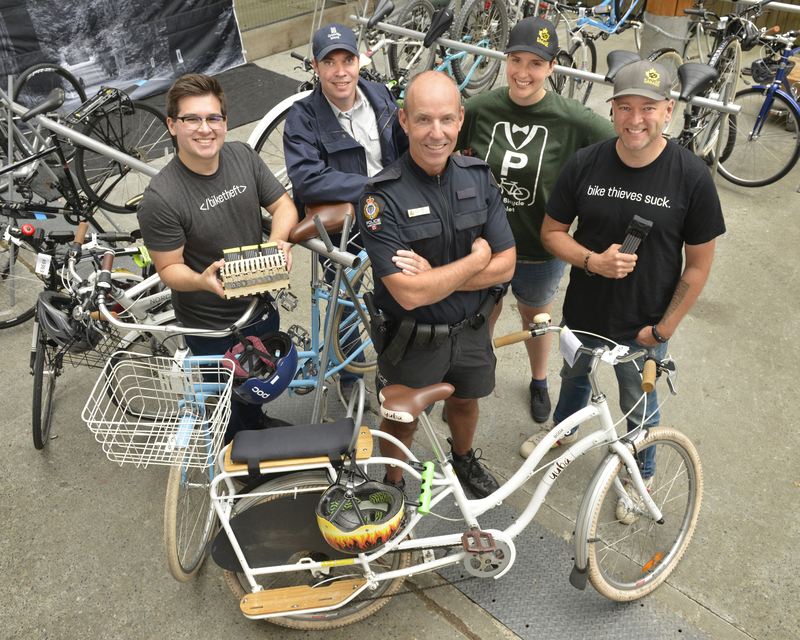 Vancouver, BC (September 22, 2016) – The broad-based partnership program Operation Rudy, established to cut down bicycle theft on Granville Island, has had stunning results. The multi-faceted program has reduced bike thefts on the Island by 60 per cent over the summer months with an astounding 80% drop in the month of August alone. Developed by CMHC – Granville Island, Project 529, The City of Vancouver, The Vancouver Police Department, Better Environmentally Sound Transportation (B.E.S.T. ), Vancouver Board of Parks and Recreation, and several Island businesses, the initiative launched on July 25. Its key strategies were to provide easy bicycle storage and registration, improve cyclists’ security habits through information and loaner locks, apprehend bicycle thieves through the VPD Bait Bike program, and position more racks in the open to deter thefts. More than 10,000 bikes were parked with the island’s Bicycle Valet service, operated by B.E.S.T. The free service offered monitored bicycle storage to cyclists, seven-days-a-week, June 11 through Labour Day. 1,400 bikes were registered with Project 529’s modern, easy, free bicycle registration service, 529 Garage, operating in conjunction with the Bicycle Valet. Many municipal police departments, including the Vancouver Police Department, recommend this system. Cyclists can register their own bike with 529 Garage at any time through their website atproject529.com. More than 100 people per month borrowed top-of-the-line ABUS Bordo folding locks (free of charge) through the Loaner Lock program created by Project 529 and lock manufacturer ABUS. Granville Island businesses supporting the ongoing Loaner Lock program include: Cats Social House, Granville Island Brewing Taproom, Off the Tracks Café, A Bread Affair, False Creek Community Centre, and The Keg. The Vancouver Police Department’s Bait Bike program on the Island resulted in six arrests. 64 new bicycle spaces were created in higher visibility spots outside the Public Market for safer bike parking. The initiative also encompassed educational signs posted on bike racks throughout the Island, reminding cyclists to lock their bikes properly, and Bait Bikes placed by the Vancouver Police Department to catch and deter thieves.